National Express Coach to Totnes (nearest) or Plymouth. Telephone 08705 808080 or contact your local travel agent. The bus company First Western run a service from Plymouth to Dartmouth via Kingsbridge and Stokenham village (this is our nearest regular local bus stop by the mini-roundabout). There is also a service from Totnes(including the rail station) to Kingsbridge. There is a taxi rank at the Kingsbridge bus station. Should you not wish to walk the 2 miles from Stokenham to Beeson with your luggage, please let us know in advance and we can arrange to collect you from the bus stop. The First Western Customer Help line for times, fares etc is 01752 402060. 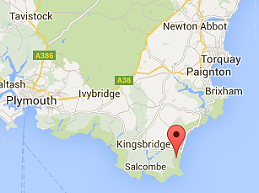 The Tally Ho bus company can be contacted on 01548 853081 which serves routes around Kingsbridge and Salcombe estuary. The Coleridge bus links villages in our area on an infrequent basis and serves the east side of the Kingsbridge estuary including Chillington, East Prawle, South pool, Torcross, Beeson and Beesands. Please call Barbara Jones on 01548 852157. This service comes to Beeson on Fridays. The Kingsbridge Tourist Information Centre can be contacted on 01548 854787 . Direct to Totnes and Plymouth from London (Paddington) the Midlands and the North Tel: 08457 484950 or contact your rail travel agent. Steam railways run from Paington to Kingswear (Dartmouth via the passenger ferry) call Paignton station on on 01803 555872 who also have details of the Award Winning “Round Robin” which combines river cruise, steam train ride and bus trip. The South Devon Steam Railway between Buckfastleigh and Totnes for times and fares call 0845 3451 427. The National Rail Enquiry Bureau has a 24 hour service on 0845 748 4950 and minicom 0845 605 060. The South West Coastal footpath is nearby at Beesands. Information and guides on local walks and green lane circular paths around Beeson and the South Hams, cycle routes and hire and historic town trail leaflets are available in each cottage for guests to use during their stay. Dry and secure barn storage for bikes, bike and car roof racks, canoes and parking for dinghys is available at no cost. Sail / Boat hire / Tuition is offered by the Dart Sailing School who can be contacted by telephone on 01803 833973, or the Island Cruising Club in Salcombe can be contacted on 01548 531176.